Here’s another dessert post, making that two in a row. I am being greedy, but it’s summer, and the fruit is impossible to resist right now. The farmers’ markets are teeming with stone fruit. Their tables are stacked with teetering towers of peaches, nectarines, apricots and early plums. I bring home bags stuffed with fruit only to return with more the next day. It really isn’t a challenge to slurp through the bounty, but when there is a little too much, the older fruit is quickly transformed into a baked dessert. Tarte Tatin (an upside down caramelized tart) is a beautiful way to showcase stone fruit. The fruits’ sweet tanginess melds beautifully with the caramel, while their orange and crimson mottled flesh intensifies in a vibrant, richly colored filling. I used a combination of nectarines and plums, because that’s what I had. Combine flour, sugar and salt in bowl of food processor. Pulse to blend. Add butter and pulse until butter is size of peas. Add sour cream and pulse until moist clumps form. Gather dough into ball, flatten and wrap in plastic. Refrigerate at least 2 hours. (Can be made one day ahead; refrigerate until use. Pastry dough may also be frozen up to one month in freezer before rolling. Allow to defrost in refrigerator overnight.) Remove pastry from refrigerator and let sit at room temperature for 15 minutes before rolling out. Arrange butter in bottom of large oven-proof skillet with sloping sides (preferably cast iron.) Sprinkle 1 cup sugar evenly over butter and pan. Cook over medium heat until butter melts, the sugar is partially dissolved and the mixture is bubbling, about 2 minutes. 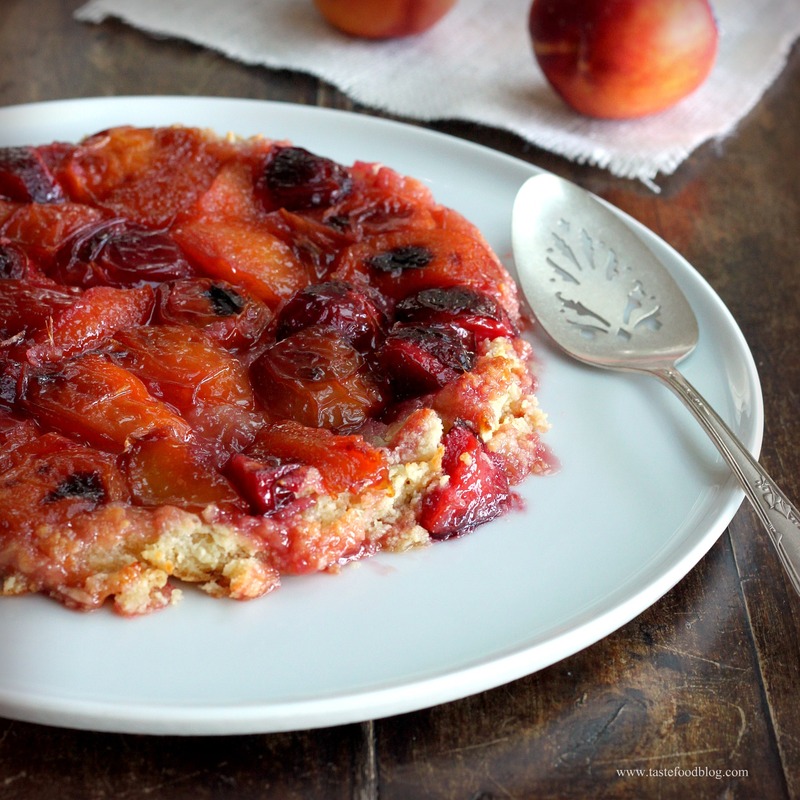 Arrange nectarines and plums closely together in an alternate fashion, cut-side up, in a circular pattern in the skillet. Sprinkle with 2 tablespoons sugar. Set skillet over medium-high heat. Boil until a deeply colored syrup forms, turning skillet to ensure even cooking, about 30 minutes. (Due to the juices from the fruit, the syrup will be more red than brown. Check for doneness by tasting a little of the syrup – be careful, because it will be very hot. If it has a caramel flavor, then it’s ready for the oven). While the fruit is cooking on the stove, preheat oven to 425 F. Roll out pastry on floured surface or parchment paper to a round shape to fit size of skillet. Remove skillet from heat. Lay pastry over fruit. Cut 3-4 slits in pastry. Brush pastry with some of the egg glaze. Bake tart until pastry is deep golden brown and firm when tapped, about 30 minutes. Remove tart from oven and cool on rack one minute. Cut around edge of skillet to loosen pastry. Invert the tart onto a platter, using oven mitts. If any of the fruit is stuck in the pan, remove with a knife and arrange on top of tart. Cool tart slightly before serving. Serve warm or at room temperature with dollop of whipped cream or vanilla ice cream. Your lucky family to enjoy these summer desserts – I need to jump on the summer baking band-wagon. Our stone fruit has just been coming into our markets and starting to taste “ready”. Great dessert! I can see why you wanted to make it. I love the sour cream pastry and the topping. Although, I guess technically it’s the bottom. Oh, I am bookmarking this for sure. I am super jealous of the teetering towers of stone fruit. Ours (here in New Jersey) are still at least a month out. I do hope to make this very soon, though. I’ll report back when I do. OMG, this looks just amazing. And I love the addition of the sour cream in the pastry. I’m making this over 4th of July weekend for sure!! Looks amazing!! I’d eat this for breakfast, lunch, dessert–any time! I agree, all of the fresh fruit is impossible to resist. If I can do it, then you can do it! I’m wishing I had some of this right now as a bedtime snack. (And again when I wake up for breakfast.) I love the flavors – and the colors are just so fun too. Love these colors and sounds amazing, too! Sooo delicious Lynda! Thank you! I am so going to hunt for nectarines and plums to make this! This is a wonderful summer treat, esp. when served with a glass of chilled sparkling wine. What a gorgeous summer tart! I love the flavors that you used here and all of the rich colors that come naturally from the ingredients! Wonderful recipe. Thanks for sharing! This is my favorite dessert post of the summer thus far. You cannot beat those flavors or those colors. You really are on summer fruit dessert row. But like you mentioned how can you resist these colorful summer treat when they are at the peak of the flavor. That tatin looks so yummy. I m so loving all these stone fruit recipes these days.I need to try this soon!Looks so delish.